There are over 200 species of camellias and the flowers come in all shades of red, pinks, yellow and white and come in various shapes and sizes. Some species are grown and the leaves are picked and used for tea production (C.Sinensis), while others are cultivated for production of oil. The most popular species is probably the Camellia japonica, it is said to have over 3000 varieties, and is grown in all parts of the world with a suitable climate. The flowers are usually red and pink, some are white and others are variegated and flower generally from March to September. 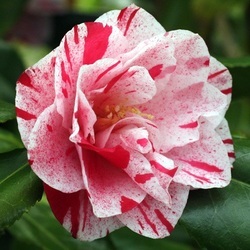 Another popular variety is the Camellia Sasanqua which also originated in Japan and is a hardy plant which flowers profusely starting in autumn. All have a delicate spicy scent but It is not as popular as the Camellia Japonica. This species is used predominantly by landscape artisans in their work and is readily available in nurseries. When cut the blooms do not last for long periods and as such their ability to be placed on the show table is generally limited. The Camellia Reticulata comes from China. They produce the largest flowers of all camellias with some blooms growing to over 25cm in diameter. They are indeed the Queen of the flowers and flower from about May to the end of September. Hybrid Camellias are not only the result of crosses from the above three species, but also includes crosses from other species such as C. pitardii, and they in turn can provide the basis for other crosses. If you decide to buy a camellia plant they can be obtained from nurseries at certain times of the year and if possible it is better to visit a specialist camellia grower who can advise you on all aspects of growing and caring of the plants. The best time to visit is at flowering time when the blooms are out. Another way is to visit the camellia show and see the blooms on display and the show officials can be asked questions about choice and growing. Becoming a member of Camellias Illawarra Inc. and learning how to strike or graft your favourite bloom is very exciting. Hybridisation of possible new blooms is a further step in your venture with Camellias. 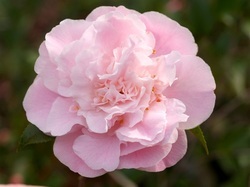 Fragrant Camellias are not extensive, but are distinctive in their fragrance. Examples are Sweet Emily Kate and Scentuous.